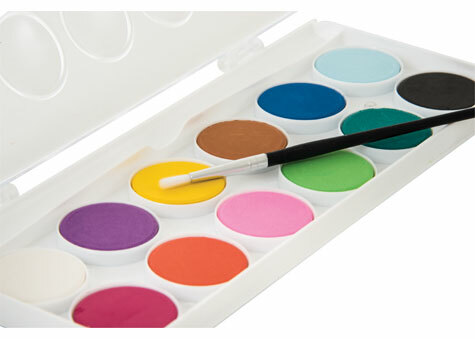 Watercolour Paint Set of 12 Colours features 12 bright, bold, non-toxic colour discs. 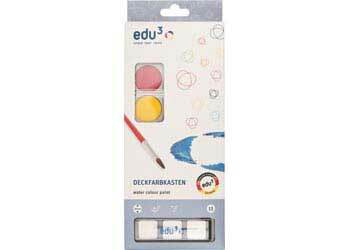 This watercolour paint set includes a bonus paint brush. 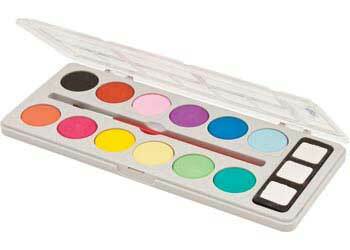 The clear plastic lid can also double as a detachable colour mixing tray/palette. Watercolours are ideal for beginner painters and provide a relatively mess free painting experience. Watercolour is one of the most commonly used painting mediums, colours can be inter-mixed and shades can be made lighter or darker by just adding more or less water! For the best painting results, use watercolour paints with watercolour paper or a heavy tooth paper over 100 gsm. 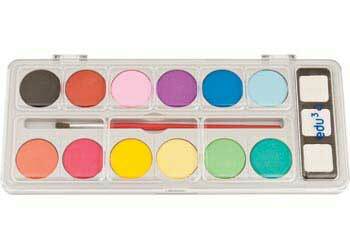 Set of 12 colours. Paint disc size: 3cm diameter.